Well, as it turned out, mother was right! It was, just my imagination! But, at that time, my imagination created the reality of fear in my life. So, although the “boogie-man” didn’t exist in the physical realm of my existence, he was very real in my mind! And because he was real in my mind, I exhibited the consequences of that reality in my physical world. That is how the human mind works! Whatever we think about with intensity and emotion on a consistent basis in our minds eventually affects our physical reality. In fact, not only will it have an effect upon our reality, it will eventually become our reality. Now this works for better or for worst! We are constantly creating our “real” world in and with our imagination. Now, in order for this to work for our benefit, we must be aware of the process and come to re-define some terms. From now on, instead of thinking of your imagination as thoughts of something that is not real, I want you to think of your imagination in terms of “the images you hold in your mind.” (If you really look at the word “imagination” you can easily see that the root word is “image.”) When we were young, we didn’t know how to control our thoughts and so our imagination would often run wild. But we must learn to harness our thoughts (the images in our minds) and think only of what we want and what would be beneficial in our lives. Most people don’t realize it, but it is possible to control your thoughts! In fact, if you want to have peace and harmony in your life, it is essential that you learn how to control your thoughts! If you don’t want something to happen; don’t think about it! Focus your thoughts on what you want; not on what you don’t want! The reason for this is because we eventually move in the direction of our thoughts and the object of our thoughts eventually make their way into our objective realities. 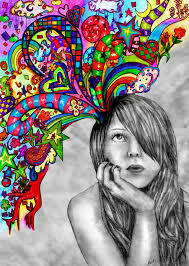 Our minds are magnets, constantly attracting the objects of our thoughts (imaginations). Remember everything that’s tangible now was, at first, just someone’s imagination! Your present thoughts (the images you are presently consistently thinking and entertaining in your mind) are the creator of your reality. If you want to change your objective tomorrow, you must change your thoughts today because in a sense, your tomorrow is already here today; it’s just your imagination!